For definitions of each enrolment type, refer to the rules governing research higher degrees. Research students can be enrolled full-time, part-time, externally or internally. Students are normally enrolled internally. Internal students study in an approved University school on campus for most or all of their candidature, except for approved periods. 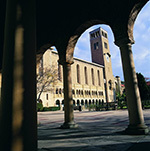 External students are those who cannot conduct research and study at UWA for most or all of their period of candidature as a result of their location. Students who are enrolled externally must normally spend no less than 13 weeks on campus during their candidature, by negotiation with their supervisors and school. Students who wish to apply for external enrolment should discuss with their supervisors how the supervision will be managed and submit a Supervision Plan with their application. Applications must be endorsed by the graduate research co-ordinator and your supervisors, and submitted to the Graduate Research and Scholarships Office for approval. If you hold a scholarship or awards, special conditions will likely apply to your enrolment. Consult the scholarships website or contact a scholarships officer for more information.